Today, my blogger BFF Rhea of rheaetcetera.com and I decided to do something fun and share with y’all our take on the Tulle skirt. We never talked about what our outfits look like or how we styled them but I loved how it turned out when I saw our pictures side by side! The contrast between Rhea’s beautifully styled ultra-feminine, dreamy pastel-colored tulle and my darker ensemble made this little collaboration of ours perfect. 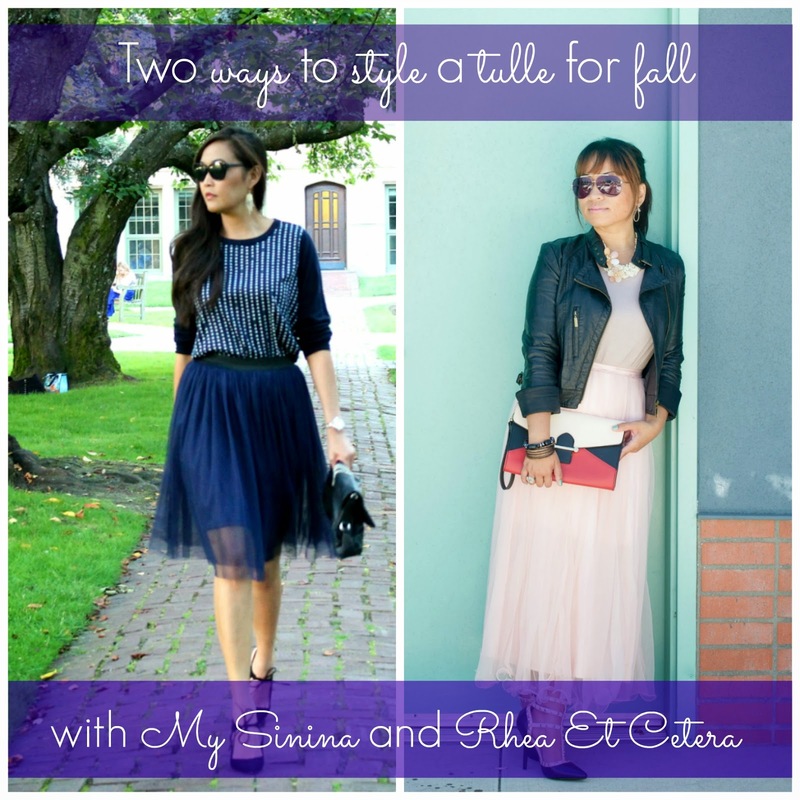 Head on over to Rhea’s blog at rheaetcetera.com to see how she styled her Tulle skirt! I love how you made this tulle skirt so wearable for everyday! I love this outfit, especially that sweater. This is such a fun collaboration. You guys both look great! That blue looks SO gorgeous on you! 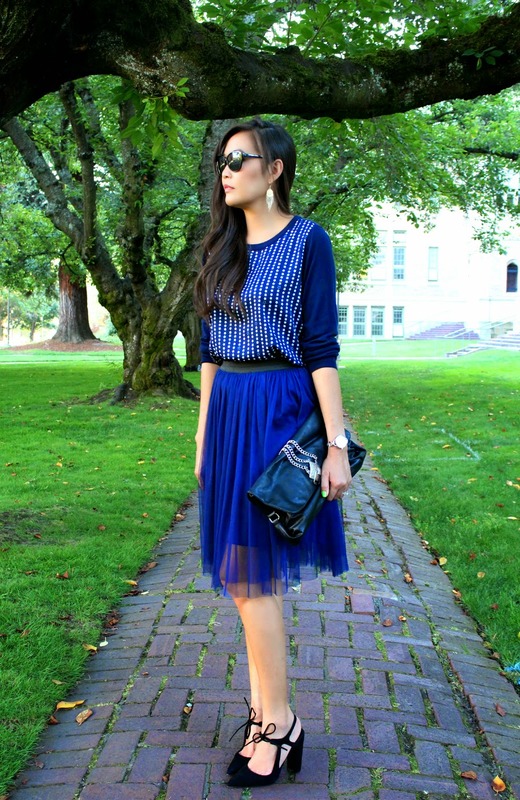 Loving this blue tulle skirt! I have never seen one in that color. It's gorgeous! I was a ballerina when I was young. A blue tutu with silver adornments. Love your skirt, so girly and pretty. I love it with the heels that tie and the ankle and the pretty navy top. Your clutch looks like the perfect size to put things in. beautiful! I love the color instead of a pale color tulle. Absolutely beautiful. I love tulle skirts. What a fabulous post!!! You look soooo stunning! Love it! Would you like to follow each other on GFC?! Let me know and follow me on my blog, I will follow you right back on both GFC and Bloglovin! Ok, so now I have the SATC theme song stuck in my head! I loved Carrie's tulle skirt and I love your take on it too. I can also see this skirt paired with a faux-fur cropped jacket during the holidays for a more "party" look. Such a fun look! Loving the cute tulle skirt. Plus, the colour really suits you. Love tulle! Used to be a ballet dancer, so I guess its fitting! PS Love the title! this is a great outfit. I love the tulle in navy. You usually associate tulle with pinks and softer colors so it's great to see the contrast. =) Great look! Love it! That top and skirt are each so pretty and they look great together! this skirt was an amazing find! it has just the right amount of volume. looks perfect with your studded top! Gorgeousness - I love the blue tulle! It looks so good with your little star top. Such a gorgeous skirt! The blue looks great on you! Such an effortless look! Love! Lately, I'm obsessing over tulle skirts! I loved this post. So fun to see two different takes on tulle. I like that your skirt is not as full as some and thus a little more wearable. 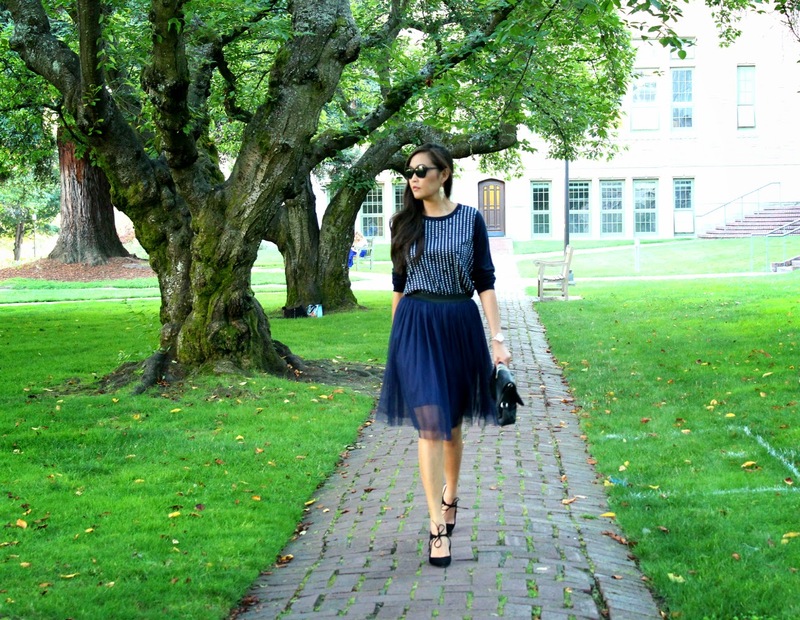 You are definitely making me want to try my tulle skirt for fall! I would be so fun with a sweater. What a great tulle skirt outfit. I have been wanting one forever but just can't justify buying it. P.S. - please stop by and join TBT Fashion link up. It's up on the blog now. love the outift! navy is so perfect for fall and i really like the black-blue combo! The tulle looks fabulous on you! Great style! Thanks for linking up with me and Lauren to day for Fab Favorites! i LOVE how you styled your tulle skirt and that you went with a black and navy theme. i know some people who don't think the two colors can be worn together, but it is one of my favorite combos!! Awww...I absolutely love this outfit - you look great! Plus, the color is fantastic! I am such a sucker for tulle skirts. I own one and have worn it once...out...in NY...haha! I don't know if it will fly in Houston, but I'm thinking if I pair it with a sweater or something simple, I could just bring my inner Carrie Bradshaw out! I like both rhea's and your tulle outfits. I had no idea how versatile they were until this Summer when I saw so many bloggers wearing them in a variety of different ways. I think navy is softer than black and as it's neutral you could probably wear any other colour with it. You look great! Gorgeous! I am so very happy that tulle has come around. I so remember clearly when Carrie wore that tulle skirt years before it was vogue and said to myself, now that is HOT when others raised an eye! I love it. If APL Logistics is sold, NOL may free up capital that will be reinvested in its core business, 2015 nike air max pas cher but it will also lose about $80m of core operating earnings. Its gross debt position will drop, yet net leverage will remain problematic. nike air max pas cher And of course there is also the competitive position of the shipping line in an industry which is almost entirely focused on economies of scale – its largest ships are 13,200teu, at the lower range of the ultra-large container vessel class and which offer considerably higher cost per slot air max pas cher operating economics compared to the 18,000-19,000teu ULCVs.